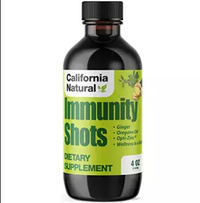 Immunity Shots, 4 fl oz (California Natural) - Penn Herb Co. Ltd.
Give Your Immune System A Shot In The Arm! Experience The Famous Malibu Juice Bar Health Sensation! The tonic formula blends powerful antibacterial agents Grapefruit Seed extract and Oregano oil PLUS Ginger, which is used around the world to support immune system and overall energy. AMOUNT PER SERVING (1/2 TEASPOON): Organic Dry and Fresh Ginger Root 315mg; Colloidal Silver 30ppm 295mg; Grapefruit Seed Extract 37mg and Pure Wild Oregano Oil (70% carvacrol) 7mg. OTHER INGREDIENTS: Vegetable Glycerin, Deionized Water, Honey. 1/2 teaspoon by itself, or mixed with water/juice once daily. For more advanced issues 1 teaspoon 3 times per day.